Keeping up with the housework can be hard for senior citizens with both short and long-term mobility issues, as well as for those who are recovering from major surgery. If you are finding it difficult keep your home clean and tidy, call Royal Canadian today and ask for help: we will be delighted to arrange for an in-home assessment of your needs so that we can create a customized housekeeping plan that addresses all of your concerns. We have been providing a homemaking service to local residents for many years and are familiar with all of the more common issues that less mobile homeowners face, as well as some of the rarer problems that are occasionally encountered. Because we carry out an in-depth assessment of your current situation and future care requirements before we put together a homemaking plan, we are able to ensure that our plan reflects all of your needs. Bathrooms – There is nothing worse than having to shower or bathe in a grimy environment and we make sure this is never the case for our clients by including bathrooms in our custom housekeeping plans. Bedrooms – The space to which you retire at the end of each day will always be nice and tidy when you hire our homemakers in Toronto: you can rely on this being the case. In addition to vacuuming and general cleaning, your helpers will make your bed so it is ready for you whenever you feel sleepy. Kitchens – Whether you still prepare your own meals or you have one of our caregivers helping you out with this daily task, you will, of course, want your kitchen to be clean at all times. Our team will give your food preparation area the once over on a regular basis to ensure that hygiene is never an issue. Fresh Laundry – Many of our clients are delighted to learn that laundry services are included in our homemaking packages as washing, folding and ironing can be a real chore if you are feeling under the weather or suffering from a condition that limits your mobility. For further information about our homemaking services please feel free to call or email us whenever it is convenient for you to do so. 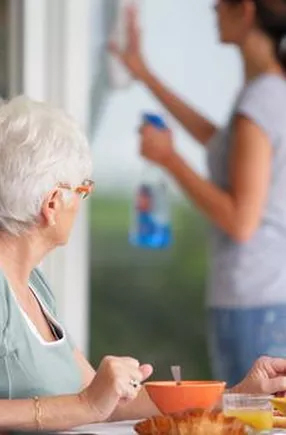 We always recommend a home visit before we create a new housekeeping plan so that all parties are clear about what needs to be done and what tasks will be completed on a regular basis by our homemakers in Toronto. Once the service starts, you will be issued with a regularly updated personal work record to ensure that all these tasks are in fact being completed.